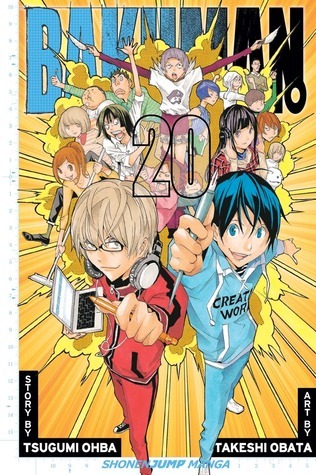 Finding the manga series Bakuman was written by the same team that wrote Death Note made me jump for joy. I started the series over a year ago, patiently waiting as the last volumes came out, too slowly for my own liking. I promised I wouldn't review the series until it was all over and I finished the last volume #20 and had to stew on it. Unlike their previous work, Bakuman is a realistic story about a pair of boys who decide they want to team up to be a manga team. Mashiro is inspired by his uncle's own work and finds a story about him and the girl he loved, promising only to write in letters until he was successful at manga. His own crush is an aspiring voice actress and they decide to only talk via phone or text until he has an anime that she becomes the lead voice actress in. At which point, they will get married. Beyond that main plot, there are the other manga artists working for the magazine, who have their own stories and personalities. My favorite of which is Eiji Nizuma – their rival and very much like the character L in their Deathnote series in mannerisms. I love his over the top ways and his predictions along with the manga he creates. All in all, this was a series that made me laugh and cry and I will hope that their next series will be coming out soon, because Obata and Ohba make a brilliant team. I can't help but wonder if a lot of their experiences with creating manga together fell into this book as it gives a deep insight into the process and politics of the manga serialization world. Final Verdict: If you like manga at all, read this series. It blew me away and I highly suggest the series to anyone – no matter what kind of manga you usually read. fee waiver the lwft of Ayala harbor, where you could do that quickly.